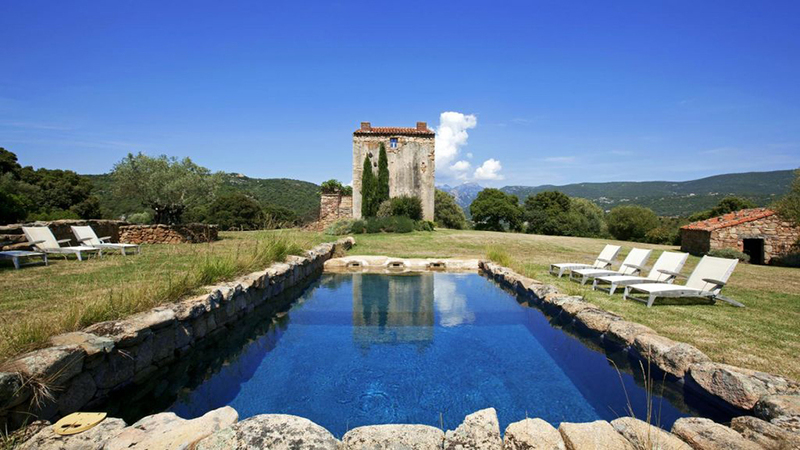 Somewhere between a gites chic and design hotel spread out over 12 luxuriously private villas in the Corsican countryside, Murtoli is a glamorous collection of private farmhouses arranged in the rolling countryside southeast of Propriano in the direction of Porto Vecchio. Far away from the congestion and mass-tourism of both cities, this majestic retreat comprises of fully furnished getaways contained within 300-year old houses with stacked-stone walls and virtuous interior design that feels neither nana-like nor provincial. Murtoli sprawls along a massive Corsican estate of wildlife like mini-pigs and occasional rooster running wild at 7am. Visitors gather for the traditional 12pm exodus to the private beach club, entirely deserted, arranged in well-spaced loungers and lunch tables as not to have a brash Manchester accent interrupt your Tatler reading, which by the way they rated as one of the world's best weekend getaways. Hence the accents. By evening, another exodus emerges for the on-site Maquis Restaurant for locally sourced meals of seafood and vegetarian delights derived form local fields and on-site organic garden. A jaw-dropping horizon of rolling hills and grassy meadows surround these clusters of 19th Century farmhouses that make up the Murtoli. Catering to as few as two or as large as fifteen, farmhouses with stacked-stone facade and white wooden windows contain period interiors with timber ceilings, dramatic wood fireplaces and herringbone floors likely to be coveted by the design aficionados that descend regularly on this little-known hotspot. Traditional furnishings are adorned with upgraded, modern upholstery for a more modern aesthetic with occasional replicated piece making a hidden appearance. Fully furnished kitchens come with vintage French stoves with heavy cookware and precious plates and stemware that make for dramatic dinners at home when not eating at the in-house eatery with their array of local, likely better-cooked delights. Bathrooms are equipped with vintage fixtures but with modern water pressure and amenities like high-end toiletries from local perfumeries. All houses come with their own private stone-encrusted swimming pool for moonlight dips in the middle of Corsican bliss.